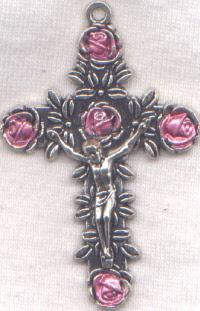 Our popular 5 roses crucifix with beautiful pink enamel roses! 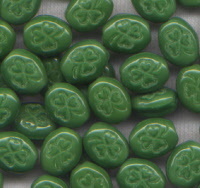 3 inch On sale until Easter! 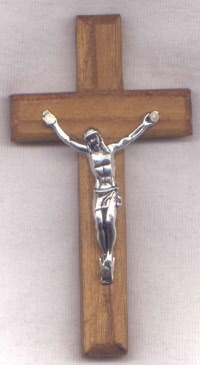 Gorgeous gorgeous crucifix! Deluxe 3-D corpus and heavy weight! 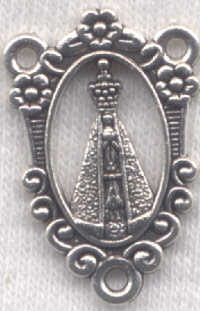 Beautiful detail of the 12 holy Apostles, 3 on each tip! 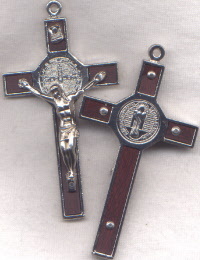 Classic St Benedict medal crucifix with inlaid wood, heavy and sturdy! 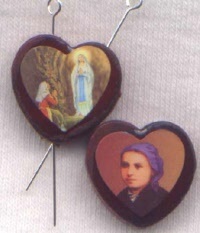 Lovely color images of the Sacred Heart of Jesus and the Immaculate Heart of Mary! 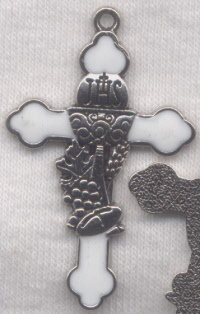 Ornate crucifix, 2 sided color center (picture shows both sides) and 2-loop medals with color image of Jesus on one side, Mary on the other! 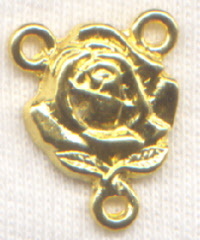 Price per ONE 1 5/8"
Gorgeous details! 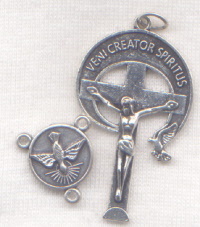 Shiny silver finish with lovely white enamel, slightly textured back. 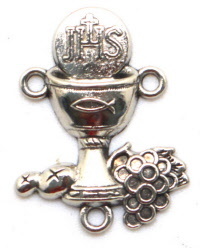 Gorgeous details on this thin, shiny silver 1st Communion center with grapes and bread and an ichtus (fish symbol) on the chalice. Very sturdy and lightweight! 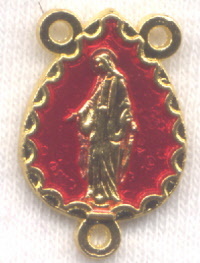 Gorgeous details on this enameled Holy Eucharist center showing the hands of the priest at the elevation of the Host at the consecration! Really really beautiful! 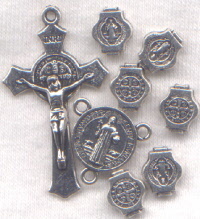 Slightly smaller St Benedict Medal set with 1 3/8" fluted crucifix, 1/2" center and 1/2" ornate St Benedict Medal beads. 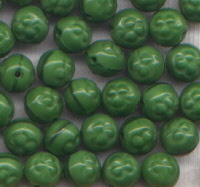 Perfect for 6mm beads! 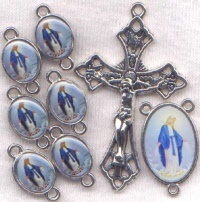 Lovely Our Lady of Grace set includes a lovely 1 3/4" ornate crucifix, 7/8" 2-sided Our Lady of Grace color center and six 2-loop 2-sided 1/2" Our Lady of Grace color picture medals. 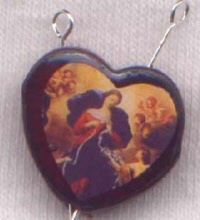 Lovely images! 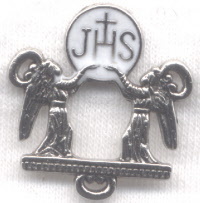 A St Joseph's exclusive vintage reproduction of the St Michael chaplet medal. 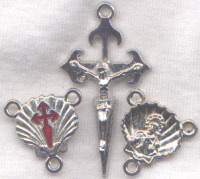 Back reads "St Michael guardian of souls, vanquisher of rebel spirits, pray for us" from the chaplet prayers. 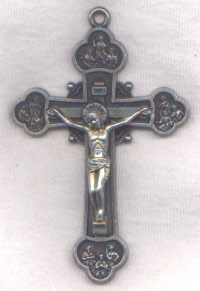 Made of hard lead-free pewter in the USA, shiny antiqued silver finish. 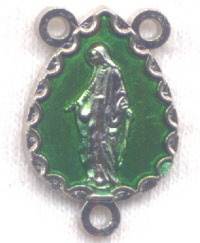 A St Joseph's exclusive vintage reproduction. 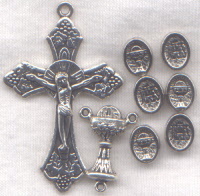 Has the correct image of Jesus giving communion to a child not an angel. 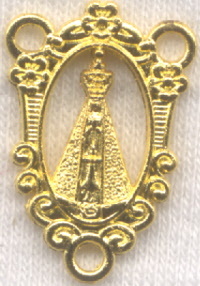 Back has the main chaplet prayer with the indulgence. 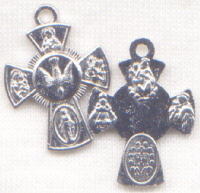 Made of hard lead free pewter in the USA, shiny antiqued silver finish. 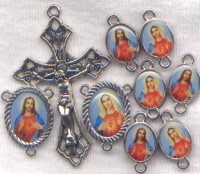 Rhomboid bars name each of the 5 mysteries of the rosary for Joyful, Sorrowful, Luminous and Glorious, each numbered. 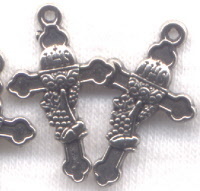 6th bar shows designation of days for each set of mysteries, Monday, Tuesday etc. 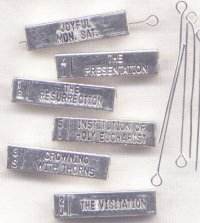 set includes long eye pins. 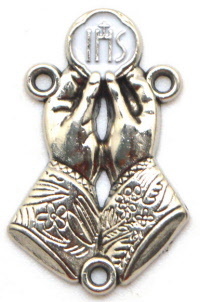 Shiny silver, beautiful details!